Two years ago at my last ever Glastonbury, before all that politics nonsense, I was lucky enough to follow Craig Richards down the rabbit hole. As a musical version of Charles Lutwidge Dodgson, he introduced me to anthropomorphic house, and I think it fair to say that I’ve not looked back since. When David Cholmondeley suggested staging a music and arts festival on his Houghton estate in Norfolk, he looked no further then this former prodigy of St Martins School of Art to bring together a bill of electronic music producers, performing their own work; think keyboards and mixing desks, and you’ve the biggest thing to happen to the “Joanna” since Chas N’ Dave. The festival began on Thursday and I have it on good authority, (I asked someone young) that Move D was phantasmagorical, although I was still at home packing. Friday was about the drive up to Norfolk, the smuggling of contraband past security, and setting up a base. The saying goes if it floats, flies, or comes with a double mattress and fresh towels, rent it; a tipi in boutique camping fitted the bill with aplomb. A stunning set from Midland rounded off the perfect night, as he somehow made it possible for us all to see the wood from the trees at the picturesque Pavilion. Saturday afternoon was spent watching Howie B perform a “fee-formed Jazz exploration’ in front of a festival crowd….well actually to just me, I think everyone else was at Terminus, a secret stage accessible by shuttle train. Apparently Voigtmann tore the place down so quickly, he was able to underpin and make good before the end of his set. A few of us hung around for Mr.Scruff, although he failed to show….. he needs to tidy up his act. Back in the day I saw Villalobos debut at DC10 and couldn’t understand what all the fuss was about then; I tried to watch him in the evening although nothing much had changed; besides the Pavilion resembled a Saturday night “Up West”, so I called it a night; one punter walked all the way to Houghton Hall thinking it was another stage; I’m sure he enjoyed the walk back taking in the Capability Brown landscape architecture, and Richard Long sculptures! Most of Sunday was spent playing “if you can’t spot the oldest man at the rave, it’s probably you”; thankfully after dazzling sets from Not an Animal and Tristan da Cunha, I spotted someone in their mid 50’s. 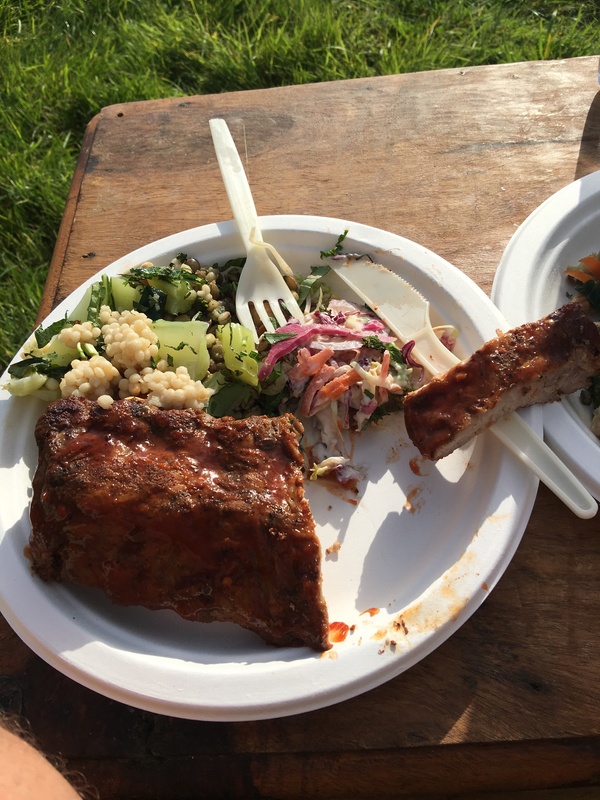 Supper at “Smokey Tail” the cult “beats & eats” pop-up, created by Seth Troxler was an absolute highlight of what was a prodigious first from the Houghton Hall boys. There’s no finer festival setting, group of people, or contemporary music in the world; they were lucky with the weather, and if they make provision for inclement conditions next year, this one could run for a very long time. For the record, I enjoyed Sticky Pork Rib with Hazelnut slaw, which is the inspiration for this week’s recipe. Heat oven to 160C/140C fan/gas 3 and snugly fit the ribs into a roasting tin. Pour over the cola and enough water to cover the ribs, then cover the tin tightly with foil. Roast for 2-3 hrs. turning halfway through, until the ribs are really tender but not falling apart. Meanwhile, put all the sauce ingredients in a small saucepan. Gently heat, then bubble for about 2 mins, stirring. When the ribs are done, carefully lift each out of the tin and sit on kitchen paper to dry. Tip away the liquid and wipe out the tin. Put the dry ribs back in the tin and coat all over with the sticky sauce. Heat until warm and sticky. Whisk together mayonnaise, lemon zest and juice, vinegar, mustard and celery salt in a small bowl, then season generously. Add cabbage, carrots, onion and celery. Mix well and add raisins and hazelnuts.